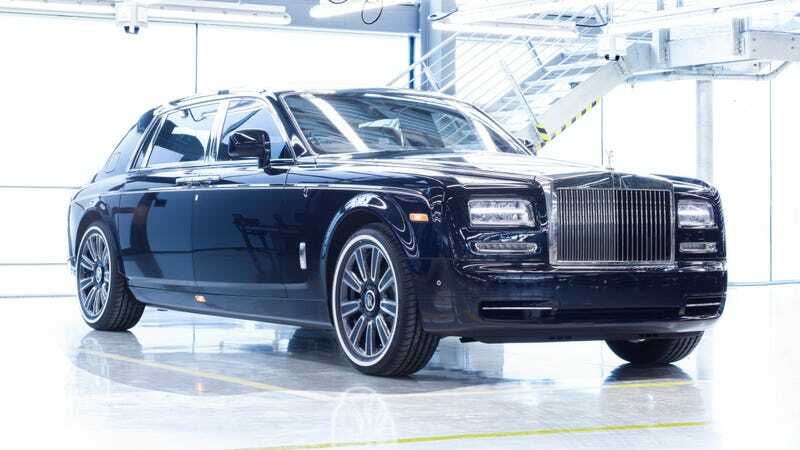 This is the final Phantom VII, a long-wheelbase version in deep Velvet Blue. Pretty, isn’t it? Today is a day of mourning. Yesterday marked the end of a nearly 14 year production run for one of my favorite cars: the Rolls-Royce Phantom VII. For many of us, who like our cars cheap, light, unpretentious, and bought off Craigslist, the Phantom is the antiChrist. I’m not in that camp. I believe a car, or at very least a daily driver, should in an ideal world prioritize the comfort of the occupants above everything but perhaps their safety. In other words, if someone gave me a blank check and told me to pick out any new car in the world for me to drive (or be driven in) every day, I would currently be in a Rolls-Royce showroom, personalizing my new Phantom to my heart’s content. I love everything about the Phantom. I love the looks and the size, which I find to be a wonderful blend of beautiful, imposing, elegant, and yes, showy. A Phantom is arriving. I love how everything, every last little minute detail, including the silent yet swift acceleration from the huge V12, is designed to relax you. When you own a Phantom, being stressed or uncomfortable is for the poor. Who wouldn’t want to spend some time back here? Just leave the junk food in the living room of you chateau, it might stain the white leather. It is doubtful that I will ever come anywhere close to owning a new Rolls-Royce. If I do, however, it will not be a Phantom VII, or whatever the successor to that car is, or whatever comes after that. If I’m able to afford one by the time I’m 60, at the rate Rolls comes out with new flagships, the Phantom VII will be four generations old. I’m brimming with excitement to see the next plutocrat’s chariot to come out of Goodwood, but I’m going to miss the old Roller. So now, I’m going to find the most expensive bottle of alcoholic drink in the house, peel the $35 price sticker off of it in the hopes that perhaps the big limo won’t notice what an affront I am, and pour one out for what has been, for the last decade and a half, the best car in the world.